"… and so the only way for us to go to that wedding would be to get rich fast," other one of the women finished her sentence to a friend of hers. almost time to leave the beach. The light had already turned more yellow, but it was so warm no one on the beach was in a hurry to leave. Janet was wearing sunglasses and while pretending to read her book she observed the little group in secret. The mother sighed and smiled to her children. It looked like they were twins. And very fast little children they were - Janet was almost exhausted by simply looking at how they had been running and swimming and playing in the water for hours. When their mother had managed to make them stop for a while, they had been eating and reading a book. It was a very colourful, big book. The story happened on a tropical island. The story told about a young man who wanted to marry the daughter of the king of the island but was too poor to do so. And so he decided to make a fortune. 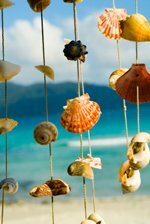 Every day he walked along the beach for hours, collecting the most beautiful sea shells and then making beautiful necklaces from them. He went door to door, selling his necklaces for a few coins. This he continued for years. The young princess refused to marry anyone else. The story had a happy ending, as expected. Eventually the young man gained so much wealth from his necklace-business that the king agreed for the princess to marry him. It sure was not a get rich fast - story. Janet knew the wedding by heart already as the little girl wanted to read it aloud over and over again. Palm trees, turquoise water, parrots, coconuts and tame animals… They were all there. Sounded a lot like a Disney film. The story ended so that the young man gave his bride a big sea shell as a gift. When she opened it there was a pearl big enough to buy the whole island if they wanted to. - How rich should we be to get to aunt Anne´s wedding? the little boy asked. - Well we´d need a pretty big pearl for sure, the mother smiled, - But never you mind about that, children don´t need to worry about how to get rich fast. Aunt Anne promised they would come here on their honeymoon, so you get to see her even if we don´t go to the wedding. The sandwiches were eaten and the kids darted our again. The ladies sat silently, keeping their eyes on the children. Soon Janet started reading again and almost forgot they were there. - Mom! Look what we brought to you! Janet looked up. The twins were standing in front of their mother holding a big plastic buckets in their hands. No idea where they had found it - it was no children´s toy. The mother looked at them in surprise. They were dirty, sand up to their hair. But the eyes were bright and their smile would have put a piano in disgrace. - Brought for me? Did you bring me something? - You said you need to get rich fast, the little girl said, - So I said to Pete we should help you. We collected all the pretty shells from the shore to a bucket so we can make necklaces! We haven´t looked into all of them but we hope there would be a pearl for you too! That way you could go to aunt Anne´s wedding! she smiled. They stood there, all proud of themselves, holding a treasure bucket of hundreds of little shells. - Come here, you two! the mother laughed and spread her arms, not minding the mess the children made to her dress when they hugged. - How lucky I am to have you two as my children - you just made me the richest person on earth! And faster than anyone could have imagined! And Janet was quite certain she wasn´t talking about money.